Hi, my name is Heather Fox and I am the proud owner of two dogs; Marley in the picture above and Loki in the picture below. I would like to say thank you for visiting my website and coming to this page to learn a bit about me before you entrust me with your dog’s training. Marley came into my life when he was 5 months old. Back then, I traveled constantly for my job but managed to teach him how to ‘sit’, ‘down’, and ‘stand’. While I wanted to do more with him, I was never home long enough to learn how. Life changes and I found myself living in New Denver, BC and working from home. The opportunity to take the Karen Pryor Academy ‘Dog Trainer Professional’ program came to the valley and I signed up right away. I did wonder why it would take six months to learn how to train dogs!! Well, now that I have graduated from the program, I am looking at two life-times of learning to explore and understand all of the facets of training, behaviour and intelligence in these wonderful dogs we share our life with. 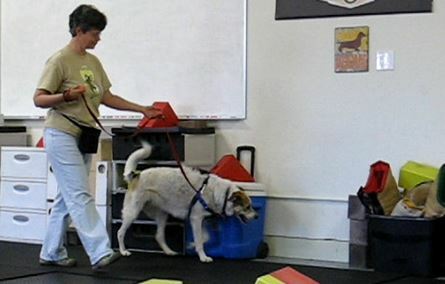 I am immersing myself in dog related learning: reading, watching videos, attending conferences and applying my knowledge to my own dogs in order to develop a skill set that can help you best by providing the most effective, and convenient solutions tailored to your specific dog training needs. When I am not helping clients enjoy an easier life with their canine companions, I like to be outside biking, hiking or skiing with Marley and Loki and setting time aside every day for on-going training, including nose work and beginner tracking.